Rural England, 1865. Katherine (Florence Pugh) is a young bride, unhappily married to the nasty son of a wealthy mine owner. Left alone when her husband is called away on business, Katherine starts to explore the grounds and embarks on a passionate affair with a young worker on her husband’s estate. Katherine’s passion is so powerful that she will stop at nothing to get what she wants. 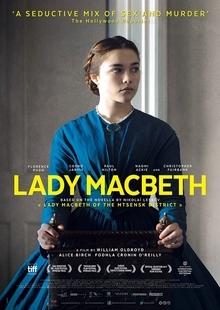 Debut director William Oldroyd and writer Alice Birch move from theatre to film with this adaptation of an 1865 Russian novella Lady Macbeth of the Mtsensk District. Proving her knockout turn in The Falling was no fluke, Pugh amazes as a heroine whose behaviour shifts from steely pride to wild-eyed lust.